Yes, yes, I know Spring is still quite a ways away. As sad as that makes me, it is indeed true. However, making this little list has really made me long for the end of these cold, dark days. Sure, layering for Winter can be nice and all, but I get so sick of wearing boots and coats and pants all the time. I love being able to comfortably wear a skirt or dress, and if I have to throw on some rain boots, and a cute rain coat, well then bring it on! I wore flats the other day... Not only did I freeze, but I slipped about a dozen times and almost fell quite a few times. I don't know if you know this, but flats don't exactly offer a whole lot of traction for snowy, icy terrain. So, with that being said, here are my picks that I am lusting after, almost as much as warm weather. I'm really into all things nautical for Spring and Summer. I don't know what it is, really. Something about the classic blue and white nautical stripes just really gets me. Toss some tan leather in the mix, and I'm swooning. I also love boat and sea creature prints. What can I say? I'm a sucker. I am also into the black and white trend right now. Stripes, polka dots, doesn't matter. I love 'em all. Paired with a red lip... ooh la la! Then, there's the Anthropologie cardigan. There's not much to say about this, except that I think I have found my soul mate. Anthropologie is great, because they really have quite a unique offering. Everything there is just so... me. I am seriously drooling right now looking at this. I look and feel like a total creep. I need this. Add to cart. Checkout. Confirm credit card information. Submit order. Thanks for stopping by! What items/ trends are you digging for Spring? Or right now? I need it to be Spring right now! I also need that Anthropologie Cardigan in my life. Love that bracelet. I wonder if I can convince my family they need to get me additional Christmas gifts . . . .hmmm. 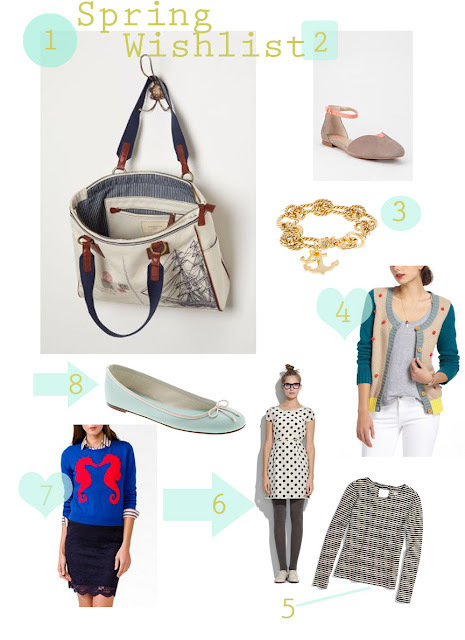 A very nice spring wish list. The Madwell dress looks adorable!